France’s interior minister says more yellow vest protesters took to the streets around the country than in recent weeks and more than 200 people were arrested. Christophe Castaner told reporters Saturday that heightened security allowed police to prevent renewed rioting, a week after protesters set fires and ransacked luxury stores on Paris’ Champs-Elysees. Castaner said among the 233 arrests were people trying to come to Paris to protest with baseball bats, slingshots and other potential weapons. Castaner estimated that 40,500 people took part in protests Saturday around France, up from 14,500 a week ago. This week’s protests were more spread out, with just 5,000 estimated in Paris compared to 10,000 last Saturday. The turnout was much bigger early on in the 4-month-old movement against economic problems. Paris police say an officer has suffered a heart problem during yellow vest protests and is in “very serious” condition. The Paris police headquarters said Saturday that the policeman was hospitalized and that the police chief is following the situation closely. Officials provided no further details. Associated Press journalists at Republic Plaza saw the officer drop to the ground, and then get apparent first aid before being carried away on a stretcher. There was no unrest nearby at the time. The incident came amid scattered clashes between protesters and police after a peaceful march through the city dispersed. At least 2,000 people have been injured in protest violence since the yellow vest movement began in November but no deaths have been reported. Eleven people have been killed in protest-related road accidents. A closely watched yellow vest march in Paris has ended peacefully, though police fired tear gas on masked protesters after it dispersed and tensions erupted in other cities. 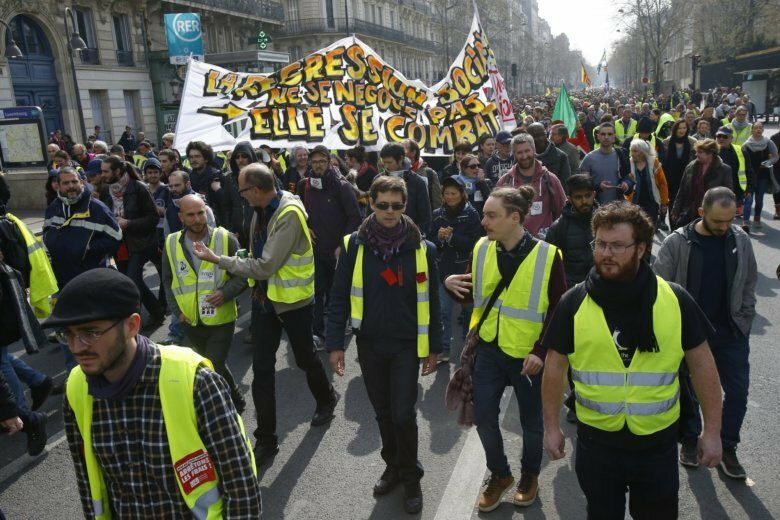 The numbers of demonstrators in Paris and nationwide Saturday are down from a week ago, when the yellow vest movement seeking economic justice saw a resurgence of protest participants and rioting. The French Interior Ministry estimated 8,300 protesters were involved in actions as of mid-afternoon, including 3,100 in Paris. There were about 10,000 in Paris alone last week. An hours-long march Saturday through Paris ended beneath the white domed Sacre-Coeur Cathedral atop the Montmartre hill. Tourists milled amid crowds of yellow-vested demonstrators. No clashes broke out during the march but police started firing on masked protesters who were shouting and throwing projectiles on a nearby boulevard after it ended. French television showed images of tear gas fired by police and fires set by protesters in the southern city of Montpellier. Protesters scuffled with police in Nice, where protests in the center of town were banned. Thousands of yellow vest protesters are marching through Paris amid heightened security a week after resurgent rioting by demonstrators angry at President Emmanuel Macron. The crowd gathered peacefully at Denfert-Rochereau Square in southern Paris and then headed through the Left Bank. The protesters are expected to finish Saturday’s march in the tourist-heavy neighborhood of Montmartre around its signature monument, the hilltop Sacre-Coeur Cathedral. Paris police said they detained 51 people by early afternoon, issued 29 fines and conducted 4,688 “preventive checks” on protesters entering the capital. Police blocked protesters from streets off the officially declared march route. Protesters were also barred from the Arc de Triomphe and ritzy Champs-Elysees avenue, scene of life-threatening fires and ransacked luxury stores a week ago. The yellow vest movement has been losing support but is trying to keep up pressure on Macron over policies they see as favoring big business and the rich. New Paris police chief Didier Lallement, who took charge following last week’s protests, said specific police units have been created to react faster to any violence. In Paris, yellow vests issued calls for a gathering on Trocadero plaza, next to the Eiffel Tower, and a demonstration from the south of the capital to Montmartre neighborhood.